Indian Vanity Case: MEOW! Avon Cat Manicure Set | Mega Effects Mascara, Etc. MEOW! Avon Cat Manicure Set | Mega Effects Mascara, Etc. Oh, so very MEOW! Doesn't she look fabulous?! So, one Friday evening, when I reached home, I saw a Avon brochure outside our front door, leaning on the wall next to the doormat. It felt kind of surreal. In August, I'd made this post about the Mega Effects Mascara, and then I felt lazy about ordering it on Ebay. When I laid eyes on the brochure, the mascara was the only thing that popped in my head. I thought, 'Meant To Be'. Tucked in the brochure was a receipt/order form where I was supposed to write down what I wanted to order, and on it was also a note saying I just had to leave the brochure out again on Monday morning, so the Avon rep could come and collect it. Now that, ladies, is a super cool way to shop. Doorstep Shopping. It's made of some kind of leather. Plain pink at the back. I thought the pink bow would be a real pink ribbon. It's not, in case you're also delusional... hehe. It holds Scissors, Nail Cutter, Cuticle Cutter, Tweezers, Filer. LOVE that the heart print! Avon Mega Effects Mascara ~ I wanted to try this mascara badly because of the uber cute design and never-before-seen Wonderbrush. I will let you know how I find it. Fingers crossed. Mega Effects Mascara ~ £10 | Rs.1020. I wanted that Jewelry Holder & Mug With Tray as well, but they would be hard to pack when I leave, sadly. I absolutely love anything to do with cats! They're so funny and cute. WOW, I am mesmerized by that packaging! I can't see anything else.... blinded. Cuteness!!! Btw the mascara looks a bit scary! 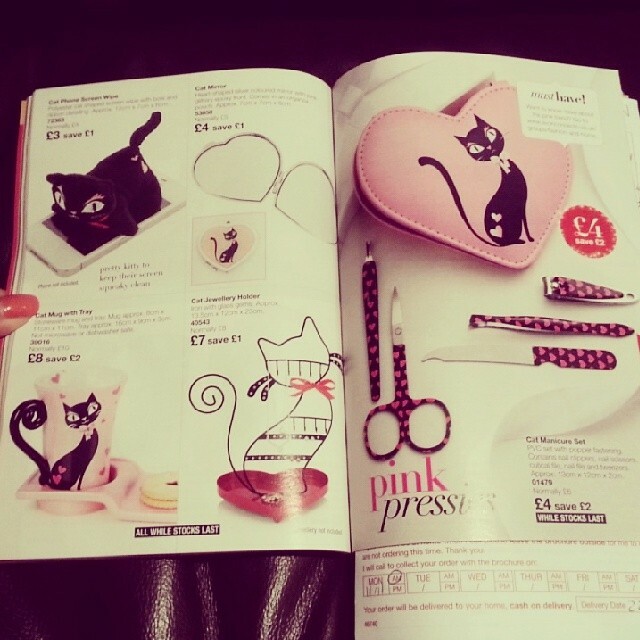 those cat manicure kit is totally adorable!! Wow!! I have never seen such a mascara!! waiting for your review! !